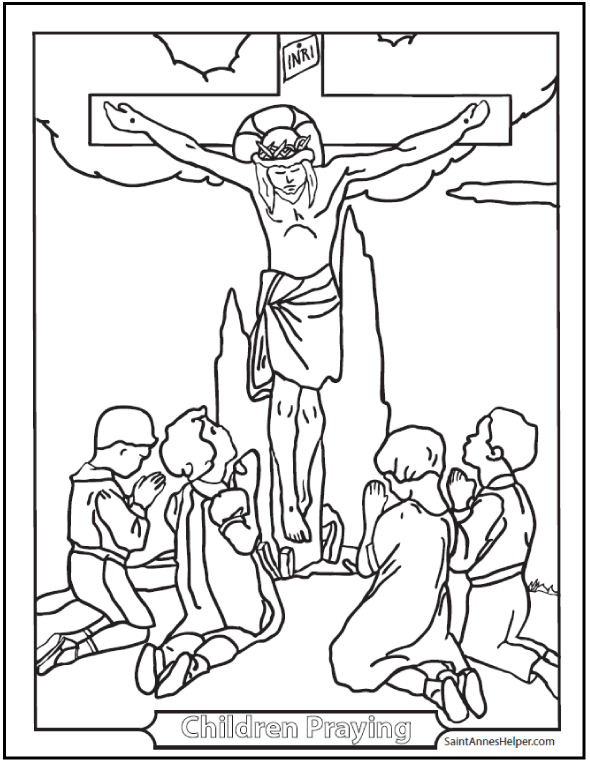 Good Friday coloring pages for the day Jesus Died on the Cross. 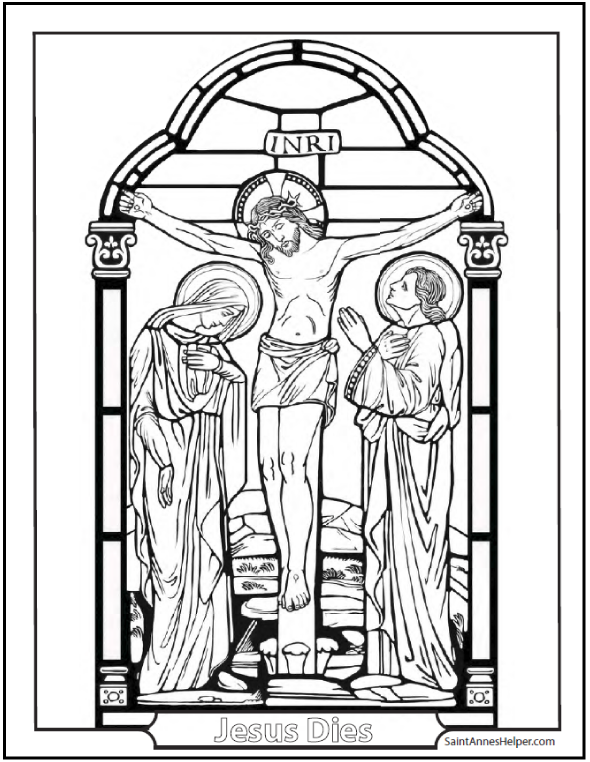 Print our Good Friday coloring pages for catechism class during Holy Week. They can help children learn to know, love and serve Jesus. They're interactive so that once they are downloaded you or the children can add names and messages. 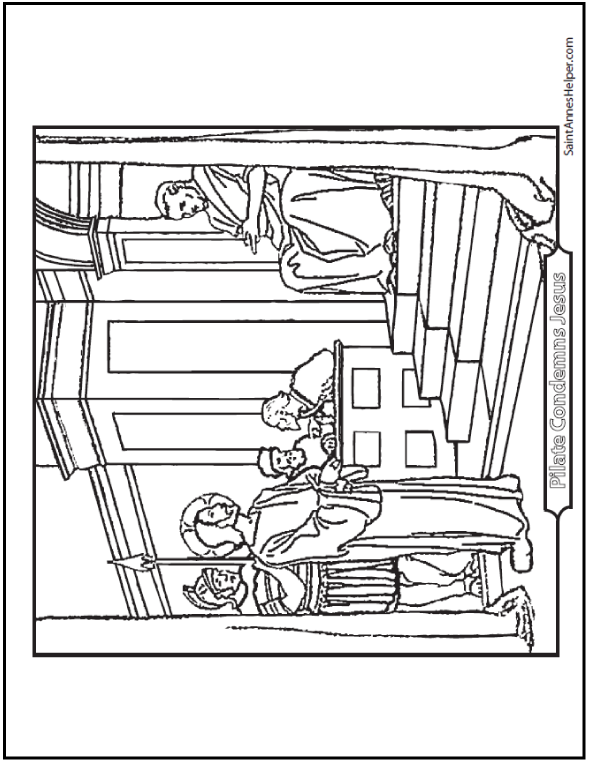 We also have added new coloring pages. 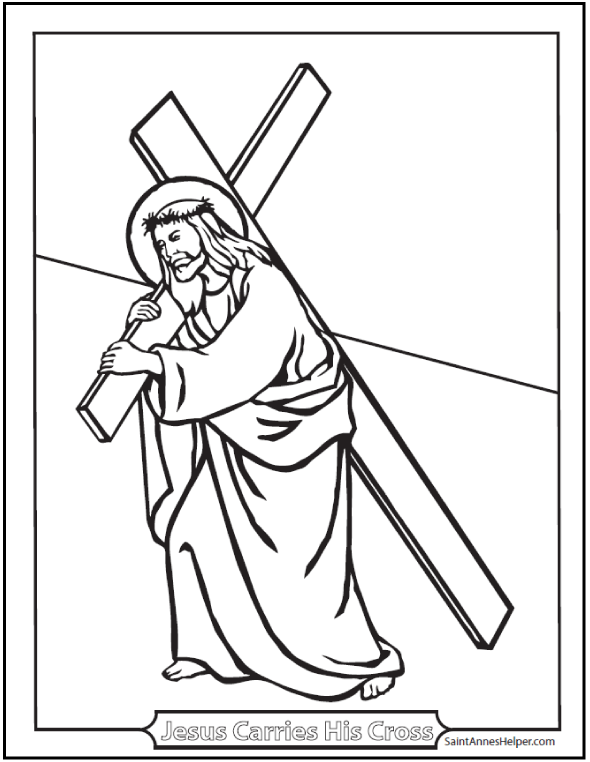 See more Holy Week and Good Friday coloring pages on our Lent and Bible story coloring pages. 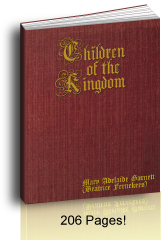 Children love Tres Ore, the Veneration of the Cross, and the Stations of the Cross. Teach them about fasting and abstinence, teaching that this is a day to abstain from meat (under pain of mortal sin for those of us in the right ages). The story of Good Friday is given in the Four Gospels which give the meaning of Good Friday to our salvation. The Gospel of St. John is perfect for Good Friday, which is the day that Jesus Christ was crucified and died for our sins. It is the day of our Redemption. the Mass of the Presanctified with its devotion to kissing the foot of the Cross. Be prepared that this can be a huge day if you do all that the church offers on Good Friday, but know that it is so worth it. Our family dearly loves all of the Good Friday services and we look forward to them every year. One thing to consider is that as with the rest of Lent it is very nice to consider the season and wear darker or muted colors. Black, purple, navy blue, and grays are very appropriate. I remember the first time I saw people respecting the day in dark clothes as for a funeral. I realized that Good Friday is a remembrance of the day Jesus died and have tried to dress for the occasion ever since. Save the spring clothes for Easter Sunday! If you are fortunate enough to live near a church that sings Tenebrae. Go! It is as beautiful as Vespers and Compline and children love it. It is the morning Office on Holy Thursday, Good Friday, and Holy Saturday. It is wonderful to hear the religious singing in choir which means that they answer each other just like we lead and follow the Rosary. Better it uses Gregorian Chant! If you are taking tiny children you'll want to know that the altar boy extinguishes each of the 12 candles one at a time and when the last one is extinguished, the lights go out. Children love to keep track of the candles. It also lets you and them know when the end of Tenebrae is close. Snuffing the last candle is the symbol of Jesus' death. Some parishes also imitate the earthquake by knocking on the pews, so prepare tiny children for this big surprise! Tres Ore is Three Hours. It is the time that Jesus hung on the Cross from noon to 3 pm. and read or pray again. If you're fortunate enough to live near where you can go to the Good Friday services, go. 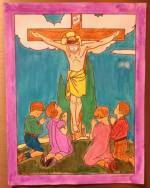 The children really love Stations and the Veneration of the Cross. Teach the children that they can go to the Communion rail to kiss the foot of the Cross. 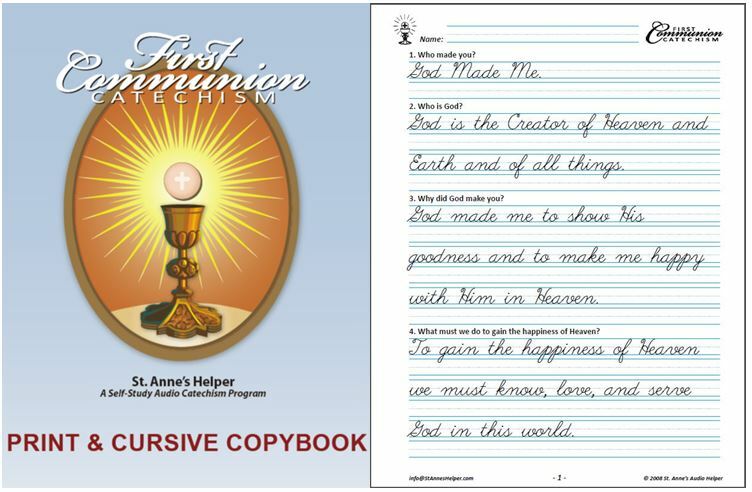 This is great to practice during the First Communion year, as is Ash Wednesday. Little ones can walk with you in procession like they will for their first reception of the Holy Eucharist. Practice ahead of time walking in a straight line while teaching them to fold their hands well (pointing to Heaven). Then practice kissing Jesus' feet on the Cross. This might save a tumble at church. Practice giving a quick and respectful peck rather than a messy smoocher. This act of love for Jesus is what matters more than solid contact. Tenebrae is sung by religious communities early in the mornings of Holy Thursday, Good Friday, and Holy Saturday - the last days of Lent and Holy Week. It is so beautiful! Be encouraged to attend and read along as the candle for each prayer (12) is extinguished in reading the prophecy of Our Lord's death. The last candle is extinguished as Our Lord's death is foretold. Be ready for the earthquake surprise at the end! At the lead of a priest, the congregation knocks on the pews to imitate the earthquake at Our Lord's death. If you are reading along with the prayers the effect is inspiring. It is fascinating and consoling to note that the prophecy tells the story of Good Friday and that it all came to pass. The Catholic Good Friday liturgy covers the history of Good Friday. It is the day that Jesus Christ was abandoned and denied by His friends, unjustly judged three times, and condemned to death in the most shameful way! He even had to carry the main weapon of His own torture up the hill to Calvary. The Catholic Church puts these things before us so that we can see the gravity of our own sins that required such great suffering. Holy Week starts with Palm Sunday, runs through Holy Thursday, and Good Friday to the Easter Sunday vigil on Holy Saturday. Ash Wednesday and Good Friday are the most important days to abstain from meat and to fast since for many Catholics (depending on age, health and local ordo) it is a mortal sin to eat meat on these days. The Good Friday fast should, of course, be as good as you can make it in respect for Jesus Who gave up His flesh for our sake. Good Friday dates change each year since they depend on the variable dates of Easter Sunday as does the rest of the Catholic Lent, but it is always the Friday before Easter. Another book that I was very glad to read during Lent was A Doctor At Calvary. The movie The Passion does, too; but who can watch that more than once?! These all show the meaning of Good Friday in such a way that, if we really think of His sufferings on the Cross, we will try not to offend Him again. The Missal has the Good Friday Liturgy in short quotes from the Bible for every day of Lent leading to Good Friday. The New Marian Missal (1950, p. 346) says this, "The ceremonies of today are an interesting and dramatic representation of the Passion of Our Lord. They are divided into three parts, each having its own historical interest. 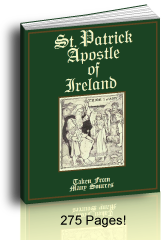 "The first part consists of readings from Scripture and a prayer followed by St. John's story of the Passion, and concluded by a long series of prayers for various intentions. In this part we have preserved the form of the earliest Christian prayer meeting - a service which was derived from the Jewish Synagogue. To this service of Scriptural readings the celebration of the Eucharist was afterwards joined to form the one solemn act of worship now called the Mass. 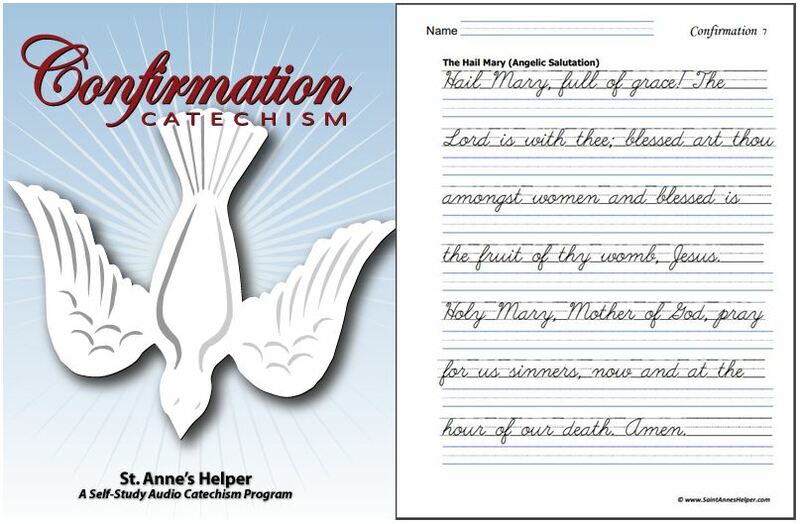 This Mass still preserves these distinct divisions: the first from the beginning to the Offertory, in which the Introit and Gloria are included; the second from the Offertory to the Communion. The first is called the Mass of the Catechumens, (for they were not permitted to remain for the celebration of the Eucharist); the second, the Mass of the Faithful. "The second part consists of the unveiling and adoration of the Cross. This ceremony was originally connected with the relic of the true Cross, and had its origin in Jerusalem. A veiled crucifix is gradually exposed to view, and three times at the words Venite Adoremus the faithful kneel in adoration to the Redeemer. "The third part consists of the procession from the altar of Repose to the High Altar, followed by the Mass of the Presanctified. This Mass is not strictly speaking, a Mass, for there is no consecration: the celebrant receives the Host that he consecrated on the previous day...."
"It is the only day in the whole year on which the Sacrifice of the Mass is not offered." We are so grateful that the faithful can receive Holy Communion on that day since it is also a First Friday sometimes! 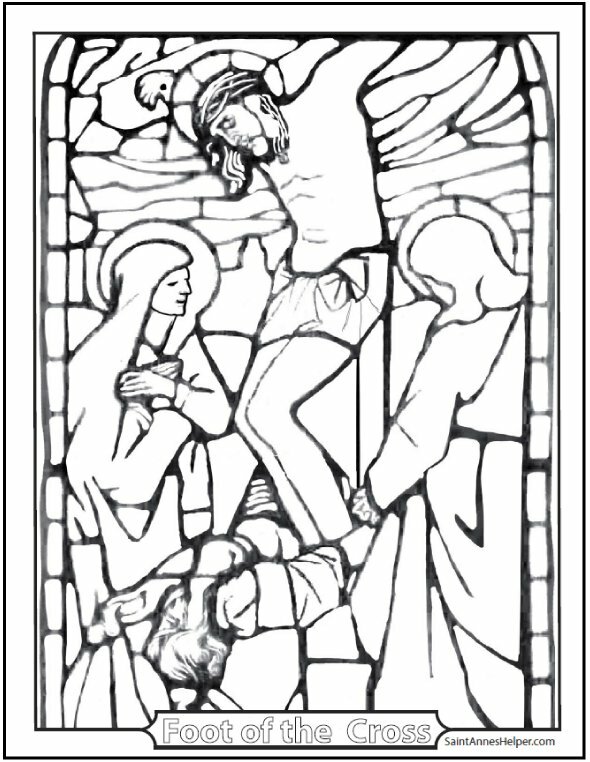 The Our Lady of Sorrows devotions booklet by TAN Books is a wonderful booklet for Good Friday. Devotions to Our Lady of Sorrow are very beautiful during Tres Ore, too. Actually, these are all good devotions for any time during Lent. If you have been fortunate enough to practice all of these devotions you will truly "Rejoice!" on Easter Sunday morning! The Holy Week and Good Friday Liturgy have taken you through the grief of Good Friday in such a way that you truly can be compassionate to Jesus and His Blessed Mother. The contrast on Easter Sunday morning is astonishing after a good Catholic Lent. There's no more engaging story on earth! 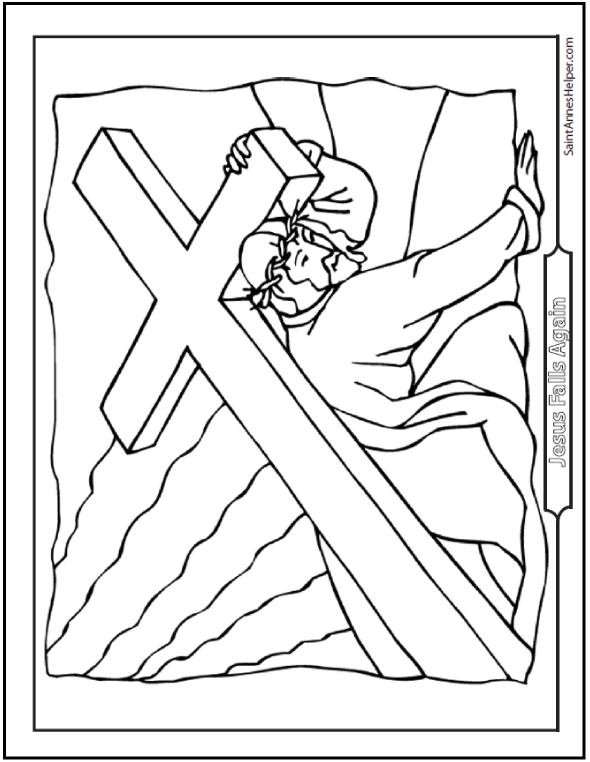 Thank you for visiting our Good Friday coloring pages.